Sculptor: Roig M-1991, G-2011-12 $69 last retail $70-$75 Little girl in white Communion dress and veil, hands folded in prayer. Girl in long blue gown and white veil, hands folded in prayer. Based on high demand that outstrips supply on retired Rabbi models in the regular Lladró collection, I expect secondary market demand for this NAO model will also be strong. Altar or choir boy looking down at dish on floor holding three copper pennies. As companion piece to #459, the effect of their side by side display is a charming tableau of two little kids assuring each other's proper prayer form. Sculptor: Francisco Catalá 1984 $95 $135-$150 Girl in long skirt and dark apron with gray shawl up over head, kneeling in prayer. Also made as Zaphir. Sculptor: Regino Torrijos 1997 $285 $300-$325 Model of Virgin Mary with hugely billowing blue veil, white gown, standing on clouds, holding sleeping Babe in arms; 13 1/4"/34 cm. 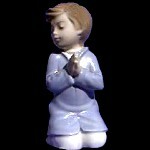 Girl in long white dress, embossed blue decoration at waist and hem, white hat, hands joined in prayer; 8 1/2"/21 cm. Same model as #1224 with Black girl. Grouping of seated Virgin in white gown and light gray veil, naked Christ Child in lap, Joseph standing beside her leaning on staff and looking proudly down. lso made in Gres as #2007. Short retail run (first issued 2003). Traditional model of resurrected Christ with arms open. Traditional model of Virgin standing on cloud, hands folded in prayer, looking over her left shoulder. Sculptor: Joan Coderch 2006 $75 $75-$85/td> Child in long gown, seated with hands folded in prayer and surrounded by a large circular corona. Standing Virgin with folded hands wearing white robes with blue sash and halo around back of head. Little girl in long white Communion dress standing with eyes closed and hands folded in prayer. Face of the Virgin in white surrounded by blue border and string on a blue ribbon. Face of the Virgin in white surrounded by pink border and string on a pink ribbon. Traditional tableau of seated Mary with standing Joseph by her side, the sleeping Baby naked in her tlap. One of the NAO collection's few forays into time-limited editions, the Prince of Egypt series was based on the Walt Disney animated feature film on the life of Moses. The aesthetic is Disney's, and these items never really caught on with Lladró collectors.